Susan grew up in Michigan and received her Masters’ degree in Education. She began her career teaching high school English, but after almost ten years of grading papers and having her days dictated by bells, she grew weary of the classroom. Susan took her love of helping people, and dislike of winter, west with the intention of finding a new avenue to give back to her community and help others. She landed in Humboldt County, was introduced to the Cannabis industry, and began studying medicinal plants with several reputable herbalists. She and her business partner, Gillian, began Humboldt Apothecary in Susan’s kitchen in 2014. Since then, they have proudly grown their business to be one of the leading tincture manufacturers in California. Susan loves making medicine and sharing her knowledge with others to help them lead happier/healthier lives. She believes that given the proper knowledge and tools, people can be empowered to take their health into their own hands most of the time. Susan also loves to spend her time outdoors. Hiking through the redwoods and walking along the ocean with her dogs is one of her favorite activities. She loves tending her vegetable garden and growing herbs and flowers. As vibrant health is a top priority, she spends a lot of time in the kitchen preparing delicious home-cooked meals and creating lots of dirty dishes. She shares her home with her awesome husband, her dog, and one very old cat. Gillian Levy is the co-founder of Humboldt Apothecary, a women-owned Cannabis tincture business in the heart of Humboldt County. She and her business partner, Susan Cleverdon, created Humboldt Apothecary with a vision of crafting Cannabis based products that could target and support healing and wellness for a variety of conditions. Gillian and Susan have used their love and knowledge of medicinal herbs to formulate blends of plants that synergize well with Cannabis to create maximum therapeutic benefits. The company commits to using the only the highest quality, most environmentally sustainable ingredients. They support organic practices and small farmers to deliver products that are safe, effective, ethical and genuinely vibrant. Gillian is also a mother of two teens, as well as a botanist, herbalist, and Cannabis advocate. She likes to empower people to take charge of their own health holistically and believes that Cannabis can be one of the best tools to facilitate that. She enjoys speaking, teaching, and writing about the benefits of Cannabis and how it can be incorporated into a daily lifestyle practice to minimize stress, pain, anxiety, insomnia, and other common challenges that we struggle with. She hopes to foster the understanding that we all possess the tools for deep healing, no matter the challenges we face, and that the practice of empowering ourselves through knowledge and taking care of our bodies can be truly inspirational for our own personal growth and well-being. When Gillian is not at work, she enjoys hot yoga, hiking, cooking for her kids, traveling the world, and being outside in beautiful places. DCN: How did the company evolve? Humboldt Apothecary: We started this company with a vision of creating a product in the cannabis industry that would suit the needs of someone that desired a more holistic product. We are both herbalists and very passionate about holistic health. We created a product line that was intended to be more like a supplement than something to get you “high”. We wanted to fill a niche for people striving for wellness with a more natural approach. We spent many months researching how cannabis was historically used within the U.S. Pharmacopeia. Blending that information in combination with our own herbal knowledge, we created products that would support different conditions and ailments for which cannabis is commonly used. We were able to gather a large amount of anecdotal data by sharing our early creations with friends and family, to inform efficacy and flavor. Many of our products contain other plant extracts as well because historically cannabis was combined with other herbal formulas. Our blends have a different effect in the body based on the synergy between the cannabis and the other plant constituents. In the beginning, our products were not as palatable and we worked to find solutions to that, as well as to create a more standardized potency of products so that consumers have a predictable and replicable experience with the product every time. We also recognized that products with high CBD and low THC were gaining in popularity and responded to that demand by creating our Sweet Jane line, which offers various CBD:THC ratios, the highest of which is a 20:1 ratio. DCN: What is the company mission? Humboldt Apothecary: Our mission is to provide the highest quality products and to offer a diverse array of products to meet the needs of individuals for all of the reasons that one would use cannabis. We are dedicated to using organic, environmentally sustainable ingredients and to supporting small farms in Humboldt County that share our vision of sustainability. DCN: What are the most significant challenges you’ve had to overcome as a company? Humboldt Apothecary: The most significant challenge has been staying on top of the constantly changing regulations. We have had to implement a complete rebranding and a redesign of all our packaging. And as the proposed regulations continue to change, we have had to make sure that our packaging remains compliant. Additionally, because these regulations are new to all facets of the industry, as well as to the regulators, we have had to devote a tremendous amount of time to working closely with the labs, the dispensaries, and with the regulators to make sure that we are all on the same page about how to interpret the regulations and to implement them in our business practices. DCN: As a cannabis company in California, what changes have you had to incorporate since 2018? Humboldt Apothecary: One of the largest changes that we have had to make is in regards to our alcohol tinctures, which have historically made up the bulk of our offerings and revenue. The Department of Public Health permitted the manufacturing of alcohol tinctures in their proposed regulations. However, the Bureau of Cannabis Control did not provide a pathway to get the alcohol tinctures through the residual solvent test for ethanol (alcohol) that is required for compliance testing. The result was that we were forced to pull all of our alcohol tinctures off of dispensary shelves by July 1. We took a huge financial hit, and many of our loyal customers were very upset to learn that they would not be able to get the products that they had come to rely upon. We have responded to this transition by creating some limited edition products that contain botanical extracts but that are alcohol-free. DCN: When building the foundation of Humboldt Apothecary, what company values did you incorporate into your company? Humboldt Apothecary: Our core values are centered around quality. We are devoted to offering products that contain the highest quality ingredients available. One component of that is using organic ingredients that are made from sustainable practices. We also use only sun-grown cannabis grown from small farms in Humboldt County. We want to support the community of farmers that helped us get our start and to work within our community to source the most important ingredient in our products, sun-grown cannabis! DCN: The company has standards when it comes to sustainability, and environmentally friendly practices, why is important for cannabis companies should be looking at adding these practices into their business? Humboldt Apothecary: We have always believed that good health starts with using ingredients that are clean and safe for the body. The best way to ensure purity is to purchase certified organic ingredients and to support organic and sustainable cultivation practices on cannabis farms. This is beneficial for the planet and better for humans as well. I think that if you want to offer a product for health, which is the intent of many cannabis companies, it is important to consider these impacts. DCN: Humboldt Apothecary incorporates using a whole plant extract, why was this important and can you share the benefits from this approach? Humboldt Apothecary: There was a very important study done by the Hebrew University of Jerusalem in 2015 that looked at the efficacy of administering an isolated CBD cannabinoid extract versus whole plant extracts that provide the full range of different cannabinoid and terpene compounds that are naturally occurring in the whole cannabis plant. The result of that study clearly indicated that the whole plant extract was far more effective at alleviating pain and inflammation in the body. In this study, pain and inflammation were the metrics to demonstrate efficacy, but I think you can apply this principle to any of the therapeutic benefits of CBD and THC. This has commonly been referred to as the “entourage effect” in the cannabis industry and is widely accepted. DCN: For those unfamiliar with tinctures, can you please share the benefits of this process? Humboldt Apothecary: Tinctures are beneficial for a variety of reasons. Because a tincture is a liquid extract, it is more easily absorbed into the bloodstream than most edibles. This is of particular importance for people that may have a compromised immune system or other health problems that may limit their ability to digest and absorb the cannabinoids. Another benefit is that it is very easy to calibrate your dose down to the milligram, which is a benefit for many consumers. Additionally, our tinctures contain very pure ingredients, so they are beneficial for individuals that are concerned about their health. Lastly, they are very discreet and easy to carry in a pocket or purse for regular dosing on the go. DCN: Building a business, can keep us busy, what is one accomplishment, goal or milestone Humboldt Apothecary has achieved that you would like to share with the DCN audience? Humboldt Apothecary: We are very proud to have built our business from the ground up with next to no funding to start! This year we built out a brand new manufacturing and distribution facility in Arcata. Additionally, we are very proud of our new branding that our team worked on extensively to be both functional and aesthetically beautiful. Having accomplished these goals in the last year has enabled us to seamlessly continue to offer our high-quality products in dispensaries around the state. DCN: What’s next for Humboldt Apothecary? Humboldt Apothecary: Based on the new proposed permanent regulations, it looks like we will be able to offer our alcohol tinctures once again starting in January of 2019. Once they are available, we are going to have our hands full, making such a broad variety of products. Additionally, we would like to start branching out into new states to meet the demands of consumers around the country. 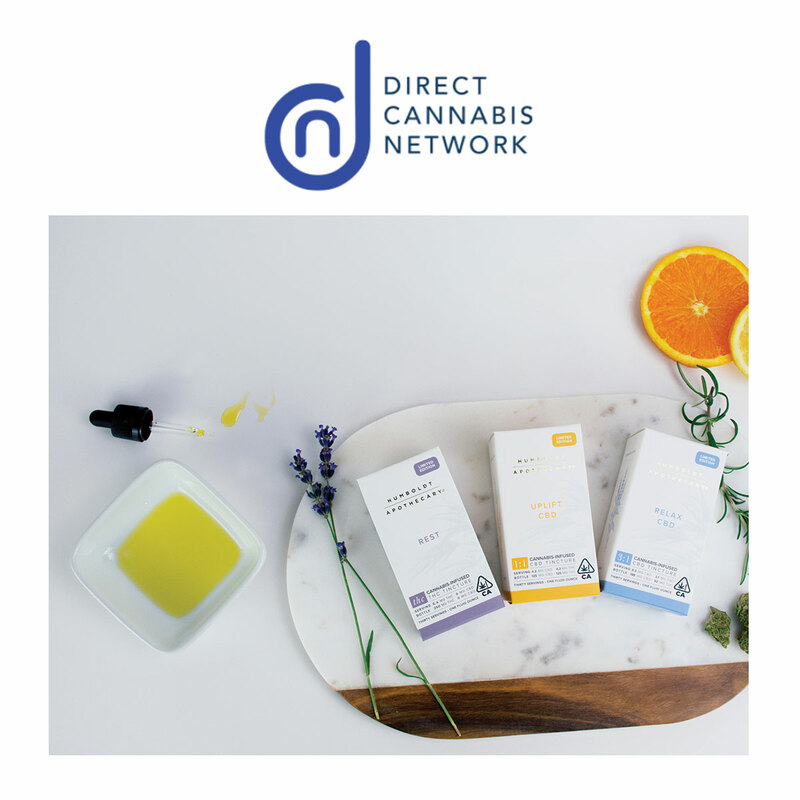 DCN: How can a dispensary or retailer contact you to find out more about your available product line and brands? They handle all of our distribution and can generally answer any questions about our product line. If someone has more detailed questions, they can contact us at humboldtapothecary@gmail.com. Additionally, we encourage people to visit our website at humboldt-apothecary.com. We offer detailed information about our products, information about dosing, a “Cannabis 101” section, as well as recipe ideas for our cannabis tinctures.